For over 800 years hardy men and women have stood up sword in hand to teach others how to fence. For over 130 years individual fencers have excelled in organized competition. And yet, for the most part, fencers today do not remember their names. Today, even the recent greats of American Fencing, including incomparable Masters such as Giorgio Santelli and Julio Martinez Castello, are forgotten by all but a handful of Veterans. We have started a Names To Know project on our Facebook and Twitter pages to remember these individuals. This project will include the well-known (at their time) and the obscure, all of whom have made a contribution to fencing. A common belief in many aboriginal societies is that you are not dead until no one can recall your name. We intend to help keep their names alive in gratitude for what they have done to make our sport great. Maitre Green’s first Fencing Master was Maestro Giorgio Santelli, the son of Maestro Italo Santelli, one of the founders of modern Hungarian sabre fencing. The Salle celebrates Maestro Giorgio Santelli’s birthday each year in honor of this extraordinary fencer who contributed so greatly to the development of the sport in the United States. Emil Beck (died 2006) – German national trainer 1986-2000, created Tauberbischofsheim center and new coaching methods. Edward Blackwell (died prior to 1734) – Colonial Virginia Fencing Master, probably resident in Williamsburg. Scott Breckenridge (1882-1941) – US National Foil Champion 1906 and 1914, member of 1912 US Olympic Team. Thomas Butler (ca. 1733-34) – slave and Fencing Master, Goose Creek, South Carolina. Basile Croquere (born ca. 1800) – highly respected black Fencing Master of New Orleans, trained in France. Francois Darrieulat (1868-1940) – French fencing master to US Naval Academy, 2 Olympic teams, and President Theodore Roosevelt. Clovis Deladrier (1885-1948) – Belgian Fencing Master at US Naval Academy, author of a classical fencing text. Hans Wilhelm Eller (died 1671) – fencing master at the Danish Soro Academy 1642-1665. Cesare Enrichetti (1871) – Fencing Master-Chief and Director of the Central School of Parma, Italy. Ricardo Enrique Manrique (born 1865) – Cuban Fencing Master in Havana and New York City. Alfred E. Finckh (1946) – Australian amateur fencer and author of one of the first post-World War II fencing manuals. Ramon Fonst (1883-1959) – Cuban amateur fencer, in 1900 first Latin American Olympic Champion in fencing. Lucien Gaudin (1886-1934) – French foil and epee fencer, winner of 6 Olympic medals and 12 other major championships. G. Hales (1614) – English gentleman fencer, author of the first fencing text to address fencing for those with disabilities. Jules Jacob (late 1800s) – Parisian Fencing Master who first called for realistic training for the epee du terrain. 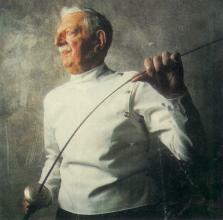 Claude La Marche (late 1800s) – French Fencing Master, in 1884 one of the founders of modern epee. Angel Lancho (1883-1939) – Spanish Fencing Master in Madrid, student of Sanz, and adherent to the Spanish School. Don Jose “Pepe” Llulla (1815-1888) – New Orleans Fencing Master, noted duelist, and cemetery owner. Giuseppe Mangiarotti (1883-1970) – Italian Olympian in 1908, originator of the Modern School of the Italian Sword. Antonio Domingos Pinto Martins (1895) – Portuguese Fencing Master to the King and the naval and military academies. Thomas Hoyer Monstery (1824-1901) – Danish Fencing Master, soldier, duelist, resident in San Francisco, New York, Chicago. ___ Nusse (1935) – German Fencing and Academical Fencing Master at the University of Bonn. George S. Patton Jr. (1885-1945) – U. S. Army officer, Olympic Pentathlete, Master of the Sword at the Mounted Service School. Jerzy Pawlowski (1932-2005) – Polish sabre fencer, multiple times Olympic and World Champion. Friedrich Anton Wilhelm Roux (1817-1897) – German Fencing Master at Jena and author of Thrust Fencing texts. Heinrich Friedrich Roux (1728-1791) – Fencing Master of German Kreussler tradition, father of Roux dynasty of Masters. Adelardo Sanz (died 1928) – Spanish Fencing Master, founder of the Spanish school of classical fencing. Hans Wilhelm Schoeffer (prior to 1642) – Fencing Master at the Danish Soro Academy for noble youth. Leonardo Terrone (1872-before 1959) – Italian Fencing Master in Philadelphia, advocate of right and left handed fencing. Ephraim Turner (died 1765) – well known Boston, Massachusetts, fencing and dancing master.